Family owned and operated by Michael Morse since 1976, Original Ferrell’s Santa Cruz is the destination of choice for both locals and visitors alike seeking fresh, quality donuts and more: such as great bagel sandwiches and made-to-order big and delicious sandwiches. 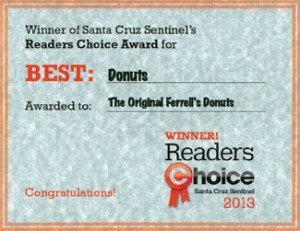 When most Santa Cruz locals think donuts, they think Original Ferrell’s, which is located at 17th Ave. and Capitola Road. Generations have come to enjoy the family tradition of bringing in the kids for sweet treats, juices, and their kid-pleasing hot chocolate. And with their newly expanded menu, there are many more reasons to enjoy Original Ferrell’s. You bet-cha! Weekdays, the Santa Cruz store opens at 5 a.m and the Scotts Valley and Aptos stores at 6 a.m.
With these early-bird opening hours, Original Ferrell’s stores are a must-stop destination for a good first cup-o’-Joe and a good bite to eat. The Santa Cruz Live Oak store is not exactly a tourist-oriented location. However, visitors from San Jose and San Francisco to Salinas to Carmel to Santa Barbara, some how find their way to the best-dern donut shop in town. highest quality ingredients available,which includes: no preservatives, additives, or any trans-fat oils. offering tasteful, accommodating interiors, our friendly staff members are interested in making your every experience an enjoyable experience. With Our Great Turkey Sundaes! you don’t have to wait until Thanksgiving to splurge on turkey and mashed potatoes. Try Our Turkey Sundae — you love it! quality donuts and pastries since 1976, no way would Mike not provide the same high-quality with his made-to-order sandwiches.